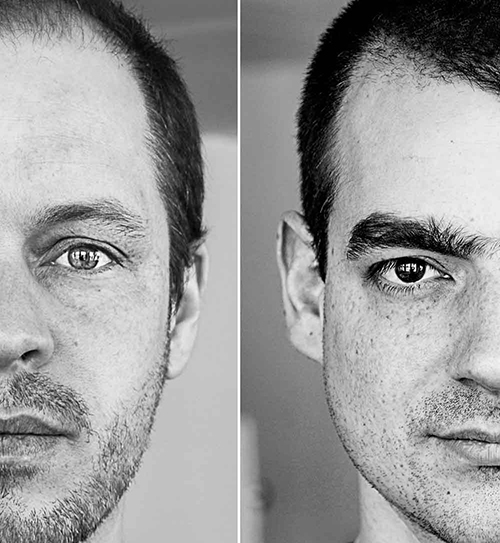 Zurich based artists David Siepert (German, *1983) and Stefan Baltensperger (Swiss, *1976) have been working collaboratively since 2007. 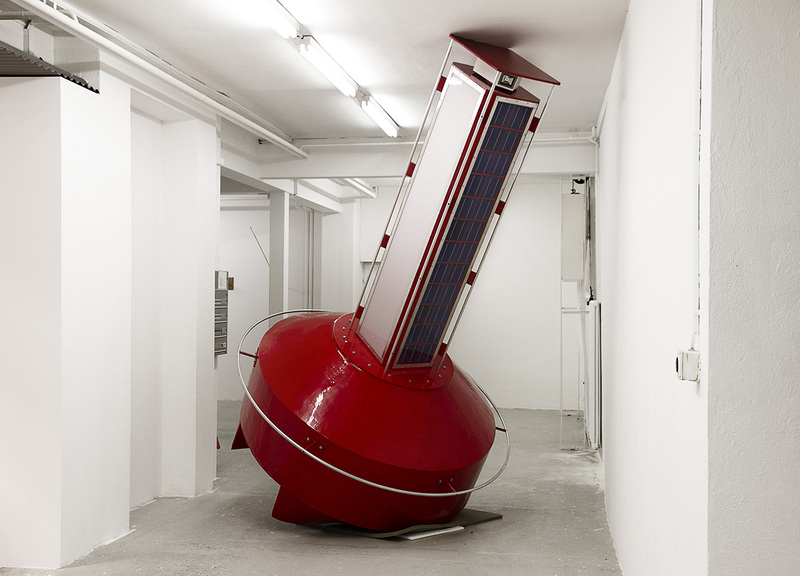 With their artistic practice Baltensperger + Siepert they critically reflect on social, cultural, and political issues. They immerse themselves into systems, aiming to make them visible and to manipulate them. Since 2010 the focus of their work is on the political and on understanding postcolonial structures. Siepert grew up in the Black Forrest in Germany and later moved to Switzerland. Baltensperger grew up in Zurich, Switzerland. Both Siepert and Baltensperger attended the Basel School of Fine Arts, as well as the graduate Fine Arts program at Zurich University of the Arts. They began collaborating while still being undergraduate students and have been working from their Zurich studio ever since. Truth is produced through a fictitious reality. How can we understand the things happening around us? Which instruments of perception are available to us and what are the limits and resistances that we are capable to fight? How is it possible to reach an understanding of the world? And what does ‚world‘ even mean? This question triggers an infinite amount of further questions, which confront us. How can we examine and evaluate our settings, and how can we interpret them in order to experience and know reality? We talk about aesthetics. Leave behind the appearance, the passing manifestations and misunderstandings of truth, to approach and affect it, her or him. We have to acknowledge that reality has a personality. Realize the personality of reality. Realize a reality. One out of many. And eventually comprehend, that without fiction, reality is unthinkable – unreal – that reality might be fiction after all. But be conscious that it also is just one of many fictions. Reality and fiction are traces and memories, woven into a pattern, following a subjective logic that no one other than the creator is able to fully grasp. There is no other option than to reboot. Have you ever touched reality? Assuming that one is not going to delve so deep as to questioning substance, this could give us a hint of its existence. Or let’s say: its fundamental nature. But most of us have not touched it. And those who have, might be locked within. No reality exists without a being – dematerialized existence. It seems to become this being within our heads. Growing out of impressions, feelings and perceptions. A process that should be questioned as long as it has not been scientifically proven. For what are impressions, feelings and perceptions? They are psychological phenomena – momentary impressions, fictions, neurophysiological circuits, that may be measured but not predicted. And they are tied to a subject. Therefore they cannot be the truly objective reality, they can only be an approach to it, which not necessarily corresponds to the truth. Truth that connotes universality spawned by the subjective body, perception, time and reason. The problem with subjectivity is that it messes with all scientific approaches. We accept science as truth, though from a philosophical point of view, it is based on something that is highly and mostly subjective. Perceptions and Interpretation. They are embedded within the narrative of cultural contexts, situations and actions. You have to know their borders and limits. We are the borders or I am the border, as everything I can’t imagine does not exist, as there is no evidence of anything existing beside our personal subjective perception. But neither are you, nor am I the only subject in our world. To be able to coexist as a subject next to others, we must enter a process of negotiation. It is a process that aims to find an acceptable understanding of things by all parties. Science once was such a concept. We are talking about consensus. To avoid a fight about the infinite interpretations of just about everything, to avoid being unable to do anything without first having to invent the tools to do so (like words), we all agree on certain frameworks. We agree to part with certain developments, to adapt to knowledge and to conform to existing discourses. But it is also an innate human urge to construct meaning by de- and then reconstructing it. Each era tries, again and again, to negotiate its own consent, which in the fictitious perception of society can at some point deviate again too much from what is perceived, after which the process starts over. No reality is eternal. This fact produces another question: Who is thus entitled to de- and reconstruct? There are several forms of authority. Authority is often misunderstood as an attribute of a person or institution, but primarily it represents a setting with two sides. One is the self-proclaimed authority and the other is the authority that transfers power to it. Some have the tendency to believe in authority and therefore let it construct our truths and realities. These truths and realities then become a dispositive that is rarely questioned. Any dispositive resembles a readymade, an objet trouvé, that is used to generate something new by and through questioning it. But it’s actually the contrary, it produces stagnation. Therefore it is important that we think out of our own boxes and confront ourselves with the fear that results from it. Because beside the fear to lose base, the absence of these old dispositives creates a need for us to forge our own „objets créés“. In the end there is also the question of reality in relation to a certain location. Reality, although apparently limited physically by mountains and oceans, is actually limited by its carrier – us. We are also limited in other fields such as language and conceivability. It seems impossible for our understanding and cultural views to expand without adaptations. So, what makes us think that we understand others or can evaluate their way of being? How can we even claim to live in a postcolonial time using methods and aesthetic tools that originate from European modernism? Evidence of the fact that we are caught in a kind of fiction, which bars us from seeing the whole thing – we are only capable of seeing parts. From our point of view, fiction can also be seen as an opportunity, as a starting point, or a door that can be opened onto a thinking space. We suggest art as a place for negotiation between different cultures. A piece of art is a thought-construct that invites the beholder and seduces her or him to engage in a thought experiment. If there were such a thing as neutrality or neutral ground, wouldn’t the white cube be predestined to be it? A place that is open for new approaches, for alternative thoughts, experiments with uncertain results? All of these thoughts, theories and abstract terms build an archive of all our artworks, and although they are more or less easy to grasp, once they take root in our art, they generate a different approach to reality that yet can not be realized or controlled. Camp West is a fictitious, occidental organization with terrorist characteristics. This organization recruits followers by promising to make them ready to fight foreigners. In 2012 we founded this fictitious organization with doubtful intentions and presented it in virtual space using an advertisement video on YouTube and a website. The project thus alternates between fiction and reality. Both in the guest book on the website and on YouTube people had the chance to leave comments. Through Facebook and newspaper reports the video went viral and generated a huge variety of comments. The actual artwork is neither the video nor the installation shown as exhibition, but the space of negotiation generated by the project. The art piece itself is the collection of comments and reactions to the video, as well as the thoughts provoked by the mere idea of such an organization. This space of negotiation and the comments can be seen as a reflection of a zeitgeist. Camp West is our contribution to the debate on consents of our time and their consequences. We produce a fiction. We produce a fictitious reality as an alibi to invite others to think and talk about it. Claiming the existence of an organization in Switzerland that strengthens and preserves Western identity from dilution could be the gateway to a “third space” of discussion – a discussion about images that we see on a daily basis, fears that govern and limit us. Thus at least we query our openness to believe in the creation of realities by mainstream media. Surely the complexity and multiplicity of incidents happening around the world is far to huge to be selected and evaluated by ourselves each day. Nevertheless it cannot be ignored how images are being generated, and by whom, in order to provoke certain reactions. One of our strategies is to play with the trust produced by authority, to manipulate the perception of the image, and to produce an alternative access into the discourse, the fiction of reality. Desti-Nation consists of 4 parts. 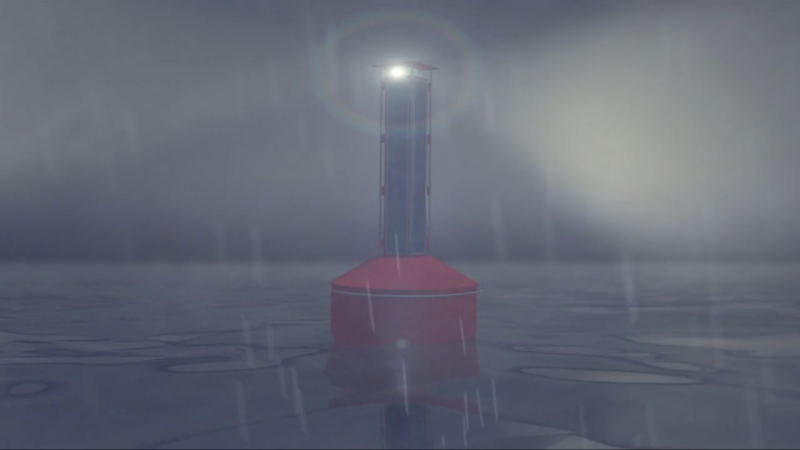 It is the prototype of a guiding-buoy, promising to provide a safe crossing of the Mediterranean Sea. The buoy works autonomously; through a website it can be called to any desired location along the North-African coast. 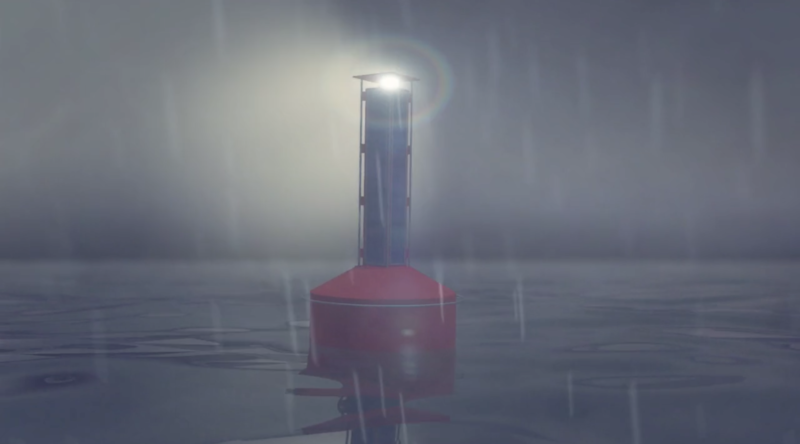 From there the buoy uses its built-in GPS to lead the refugees in their boats safely to Europe. It also is an explanatory animation video about Desti-Nation, the prototype. Exploring different strategies of the creation of reality, we worked together with Taiwan based company Next Media, which is specialized in creating animation videos for news agencies. They make animated material for events that were not covered by actual video footage, news agency Reuters being one of their main clients. Next Media created an explanatory animation video about Desti-Nation as a functional object, using their unique visual language, which everybody has learned to accept since it is seen so often on the net and on television news. Desti-Nation is also a fictional newscast. Aside from the collaboration with Next Media, we also shot our very own news-show. 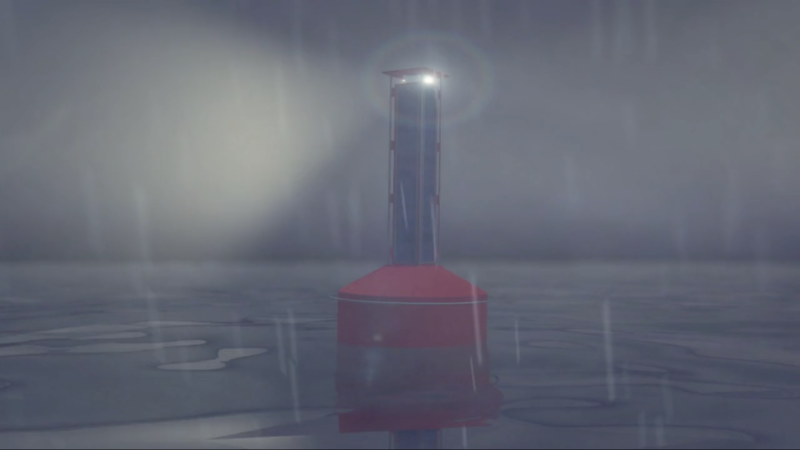 Applying visual strategies and the visual language of the news, we staged a news show that reports on the buoy, already in service in the Mediterranean Sea, including an expert discussion and the explanatory animation. The fourth part is the production of thinking spaces and spheres of potentiality, passing our own secure state in familiar white space. We let the narrative of truth go far beyond the desired and slightly provoking call to think about the current situation. Re-enacted advertising videos and news shows in international news style aim at both media and economic exploitation of such themes as well as the power of images. We think we should never underestimate the power of imagination; all pictures we deal with on a daily basis, represent a balancing act between imagination and reality. You could say that imagination produces reality. It is also imagination that makes people believe and in some circumstances follow untruths.